I will be another year older, wiser (…ish) and fabulous! Every year I get super excited about my birthday – I have never once experienced “the birthday blues” (long may that continue right?!). As is the norm, with each passing year less people care about your general ageing process and so gifts are limited. Which is grand and life etc.. etc… but because of this, about two years ago I decided to start buying myself a lil something each year, a “happy to me from me”, if you will! Today I’m sharing the bits and bobs that I’m choosing from for my pressie this year – which do you reckon I should get? If you’ve been reading this blog regularly enough you’ll know I am OBSESSED with this absolute gem of a product. Absolutely amazing foundation and I love that it has 50+ UVA UVB protection built right in. I don’t rely on it for sun protection, I still wear this everyday, but it’s great to know my foundation is a sunrays fighting superhero too! 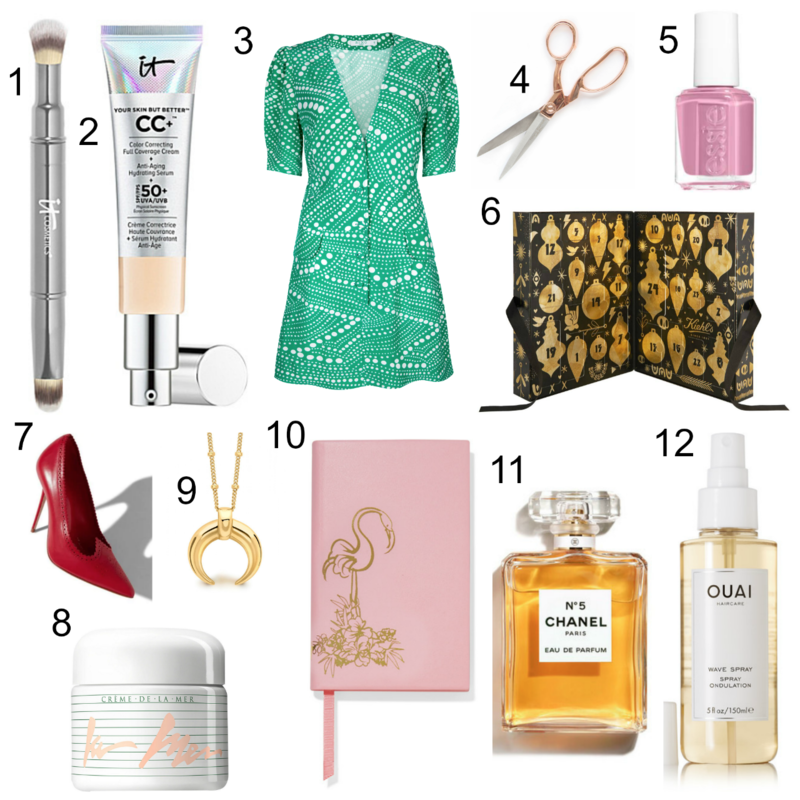 Hello beautiful Rixo dress – that is my only explanation for it being on this list to be honest! I am doing up a room in our apartment as an office/studio for my acting work – any self tapes I need to film or any admin work I need to process (contracts etc…) and I previously bought a rose gold desk organiser, so this would look great on my future desk, alongside the organiser! Have you seen my Instagram?? I love Essie – so to add to my collection from their newly launched Fall Collection, well that’d just be lovely! I actually think Himself is getting me this for my birthday which is fantastic news!!! This is the Kiehl’s Beauty Advent Calendar – I know I know!! We haven’t even reached Halloween yet, but this is the situation now with Beauty calendars – you’ve got to get in super quick! Last year I got this one and it gave me such joy that I decided I wanted to do it again. The Kiehl’s one sold out in no time last year, so when it’s released on 1st October via Selfridges – I will be online ready and waiting to nab one! Beautiful red heels evoking the Queen of Hearts made by the wonderful Manolo Blahnik – need I say more?! This has been my go to moisturiser for quite some time, but I’d love to get my hands on this vintage packaging – for no other reason than it’s lovely – the design is one of Dr. Huber’s earliest and it is being relaunched for a limited time to celebrate the good Dr for his creation. Wanted it for ages, seriously considering it and even thinking of swapping from the silver which I’ve previously written about, to the gold (pictured above) – I’ve been really into gold lately! Cause it’s pretty and I don’t own a Smythson notebook and – cause stationary. My Mom has worn Chanel No.5 since before I was born and over the last 6months, I’ve caught myself wearing it – so I feel like I need to own up and purchase a bottle and accept that I’m hijacking my Mom’s favourite fragrance – like Mother like Daughter it appears!! Last but not least, I have heard so much hype about this product that I think it’s high time I test it out for myself – if this lady is anything to go by I’m going to absolutely adore it! Word Of Warning: If you plan on doing something like this for yourself, wait until AFTER your birthday, because you never know who might be listening and decide to get something for you and then you’ll have two and…. wait…why am I saying not to do this again….? I love the It Cosmetics CC+ cream! It’s absolutely amazing, you’ll love it! Thanks Anika, can’t wait to get a tube!! Great list! Happy Early Birthday! I like your list! Happy Birthday!